Portrait photographers capture still images of people, either in formal or informal settings, to memorialize important moments in their lives. You spend some time setting up shot composition and background in a way that is flattering to the customer. Artificial or natural lighting is used by the portrait photographer to enhance appearance. The technical skills you have learned can enhance the subject, by creating a blurred background or inserting a special effect using photo editing software. You also take on certain business tasks, such as marketing, advertising and maintaining a portfolio of current work. Portrait photographers can work either in a studio, at the site of a special event, or in schools, offices and private homes. Standing or walking while carrying heavy equipment can be part of the job. 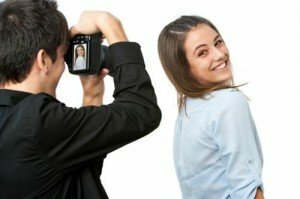 Helpful qualities to develop as you prepare to begin a career in portrait photography include artistic ability, creativity and interpersonal, technical, business, customer service and detail-oriented skills. A formal education can be very beneficial to a photographer, with many photographers pursuing a bachelor’s degree in photography or a related field. Coursework often includes working with different kinds of equipment, processing, software packages for photo editing on a computer, shooting techniques, shot composition and design. If you are considering working on a self-employed basis, you will also want to take some coursework in business, marketing and accounting to better manage the business side of your photography. After completing your educational program, working with a more experienced photographer is a good way to start in the industry. Developing a portfolio, or a set of samples of your work, is also helpful as people will want to see your work prior to hiring you. Architects plan and design a variety of structures, making them safe, functional and stylish. Can’t keep from sketching or snapping truly artistic photographs? Craft and fine artistry could be a promising future for you! Desktop publishers develop page layouts for a variety of printed media. Do you see how clothes can be done differently? Fashion designers develop concepts for new accessories, footwear and clothing. Film and video editors and camera operators collect a large amount of video or film output and condense it into a well-designed whole. Graphic designers create unique visual concepts that convey information or ideas in a variety of forms. Are you inventive with new products ideas? Industrial designers plan and develop new manufactured products. Printing workers produce an assortment of printed material, working through page layouts, the printing process and finishing work. Got a nose for news? Reporters, correspondents and broadcast news analysts present information on incidents and happenings to the general public. Self-enrichment teachers provide continuing education outside of a formal degree program in a large variety of areas. Photographers are paid an average hourly salary of $14 as of May 2010. Many photographers work on a part-time basis on flexible hours, with busy times in the wedding season and before the holidays. Portrait photography is predicted to grow at about 13% over the next decade, in line with growth expected in all sectors. Though there is a decline in opportunities to work for many direct employment options, freelance photographers are expected to see a 15% increase in opportunities.